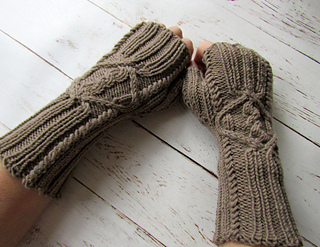 Over thin gloves, under extra thick mittens, or just on their own; I love fingerless mitts! 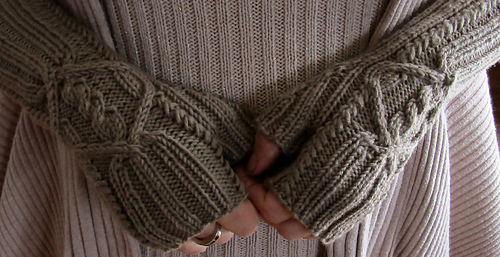 They are the perfect layering piece for my hands when there is a slight chill, or an outright winter wind in the air! 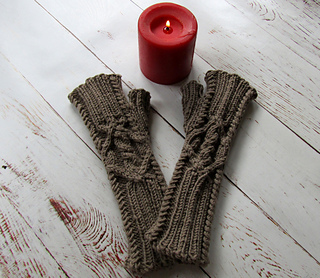 These heavily ribbed gauntlet style fingerless mitts feature mirror image cables and lots of soft ribbing to provide a warm and cozy, yet stretchy and comfortable fit. Women’s Medium sized, stretches to fit up to a 9 inch hand circumference.